Ditch that disposable BBQ that barely even stays hot for over an hour. A portable BBQ grill is undeniably a must have for barbecue lovers. 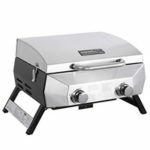 By the time you’ve spent money buying several disposable BBQs, you probably would be better off putting the money towards one of the best portable BBQ grills. Perfect for camping, fishing, picnics, festivals, beach or just even home use. 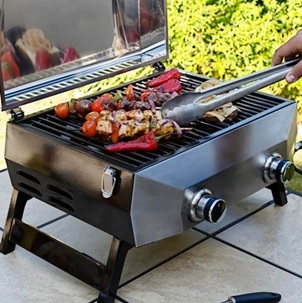 However a picnic BBQ grill will only feed smaller numbers, if you have a few tummies to feed then perhaps a 4 burner gas grill or large charcoal BBQ might be a better option. Of course you won’t be able to take it to camping or to the beach! Nowadays it’s not unusual for people to share a communal garden area, but unfortunately some neighbours just simply can’t be trusted. Therefore, if you were to have a portable garden BBQ, you can simply pack it away and bring it indoors or leave it locked in a garden storage box once you’re done with it. With a normal size BBQ don’t be surprised if your BBQ was involved in a party while you were away on holiday. 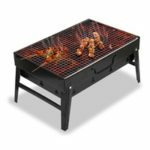 Selecting the best portable BBQ grill involves choosing one with the right features and purpose. So you’ll need to decide what you’ll mainly be using it for, for example if you want one for festivals then perhaps a foldable BBQ grill might be a better option if you have to squeeze it in a backpack. Check out our tips below on what to look out for so you can ensure you pick the best portable BBQ. 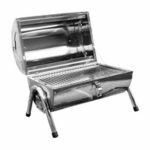 Type – Once you’ve decided on what occasions you’ll be using the picnic BBQ for, you’ll need to decide whether you want a portable gas grill or portable charcoal grill. Each one will have their pros and cons which you can compare here. 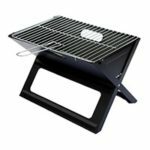 Foldable/Collapsible – A foldable or collapsible BBQ grill are very space efficient which is ideal if you have to pack it in a backpack. If you’re going to be transporting the portable grill in a car or trolley cart then you won’t be limited to only folding BBQs, since you’ll have a lot more space. Hood/Lid – When you cover the BBQ with the hood or lid, it traps heat, and as a result it will cook your food quicker. Carry Handle – Allows for easier transportation. 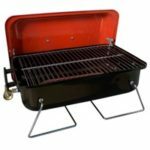 As most of the portable BBQ grills are light, it can usually be carried in one hand. Dimensions – The overall size when fully assembled. This will also tell you roughly the size of the grilling space, so more grilling space will allow you to cook more food simultaneously, which is better for larger groups. Weight – Generally relatively light, although some larger portable gas grills tend to be heavier. Whether you’re buying a full size BBQ or a portable one, unless you’re loyal to a fuel type, deciding whether to go for a gas or charcoal model can be a tough choice! Since we’re debating between portable BBQ grills, there are other factors to take into account. We’ll break down the differences between the two portable BBQ types so you can decide which one would be more suitable for you. Able to control and maintain the cooking temperature, although portable gas grills are not as versatile as full size gas BBQs. Tend to have a larger cooking area, allowing you to cook more food at a time. Easier to clean when you finished using it. It doesn’t really fold into a more compact size. Larger and heavier, therefore not as portable. Usually pricier as well, although low end basic models are affordable. Have to carry a gas canister with you as well, which will also take up quite a lot of space. 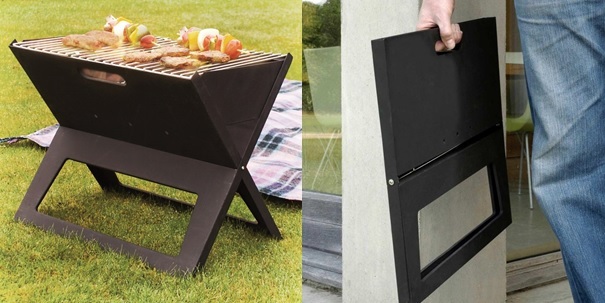 Most will fold up into a compact size, one very space saving design being the notebook BBQ. Very lightweight so easy to transport around in a backpack or by hand. Able to buy smaller bags of charcoal so you don’t have to carry around as much. A lot messier to clean, since you have to dispose of the used charcoal and ashes. Difficult to control the cooking temperature.